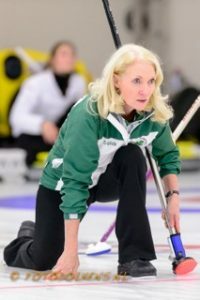 Our Irish mixed team will be gearing up to fly out to Kazan, Russia, for the 2nd World Mixed Curling Championships, which begins on Friday, October 14 and goes on to Saturday, October 22. Occupation – Inclusive Skating Chair (I develop events and opportunities for disabled skaters). In-turn or out-turn? – In-turn. Best ever curling memory? – Winning the first Irish Open Championships in memory of Isobel Fyfe – it was such an honour! If you had to switch careers, what job would you do? – I’m also a lawyer so I would go back to working in Financial Regulation in practice and/or at University again. Best / worst subjects at school? – Best – English, History, etc. Worst is definitely singing. Who’d be your four ideal dinner guests? – Jo Brand, Barack Obama, Boris Johnson, Andrew Neil – they would be very funny and entertaining! Earliest curling related memory? – watching the curling at Crossmyloof whilst I was on the end ice skating behind the yellow plastic barrier. It was Ken Horton and Graeme Adam who were practising. Favourite curling destination and why? – Any curling rink in Switzerland. I love Switzerland. How do you relax away from work (and curling)? – Spending time with my family. The person you most admire, alive or dead, and why? – Kate Caithness – because she does the right things for the right reasons. Kate introduced wheelchair curling – just because it was the right thing to do. I wish she was president of the IOC or International Skating Union or perhaps both! What did you have for breakfast this morning? – Tea and toast. This entry was posted in Event Blog and tagged World Mixed by LouiseKerr. Bookmark the permalink.